So apparently it’s summer in England but you could be forgiven for not realising. Even as I look out of my window to write this the day has gone from roof down, shades on to thunder and lightning within the space of 20 minutes. Earlier this week however there was a glimmer of light through the clouds with the first evening in a while where the weather was nice enough to sit outside. 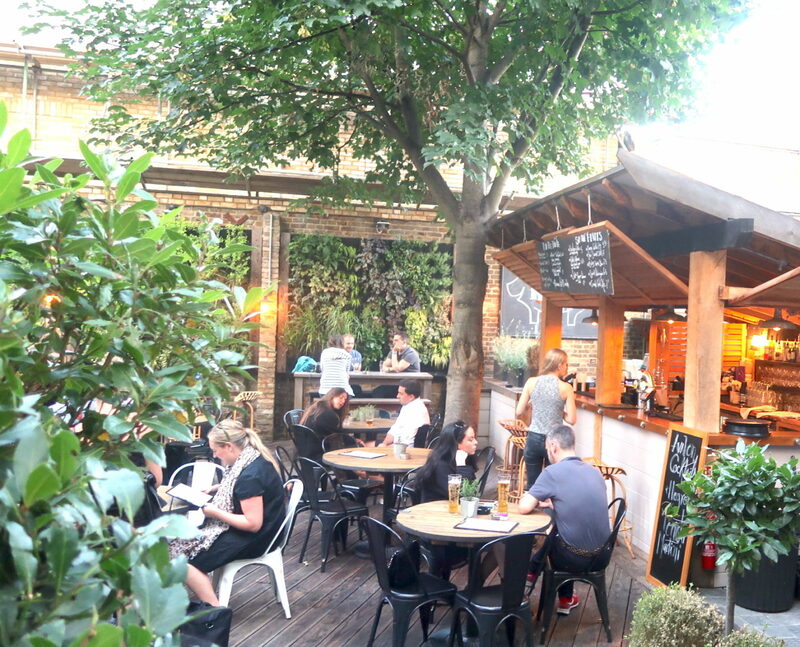 I’d been dying to get to The Avalon in Clapham for weeks now after hearing it had one of the nicest beer gardens in London so seized the opportunity to have date night al fresco. Even before getting outside the interior of the The Avalon is inviting and has a more relaxed area at the front as well as a separate dining area for a more formal yet still chilled feel. The door leading out to the back was labelled “Secret Garden” (more pics here), which it turns out is a pretty apt name as it’s definitely one of South London’s best kept secrets. The garden of The Avalon is split into three fairly distinct areas: a scattering of tables by the bar at the front (yes there’s a separate bare outside, no traipsing back inside for a drink here), a raised level with some nice big booths and finally a chill area at the back with giant bean bags (Sunday afternoon heaven!). What was an even nicer surprise though is that they do table service outside which you are hard pushed to find in London, bliss. The menu which you can read here is varied from traditional pub fair to their artisan pizzas and everything in-between. What’s nice about the starters is that they are ‘small plates’ which means that you can have 2/3 to share and sample a few. 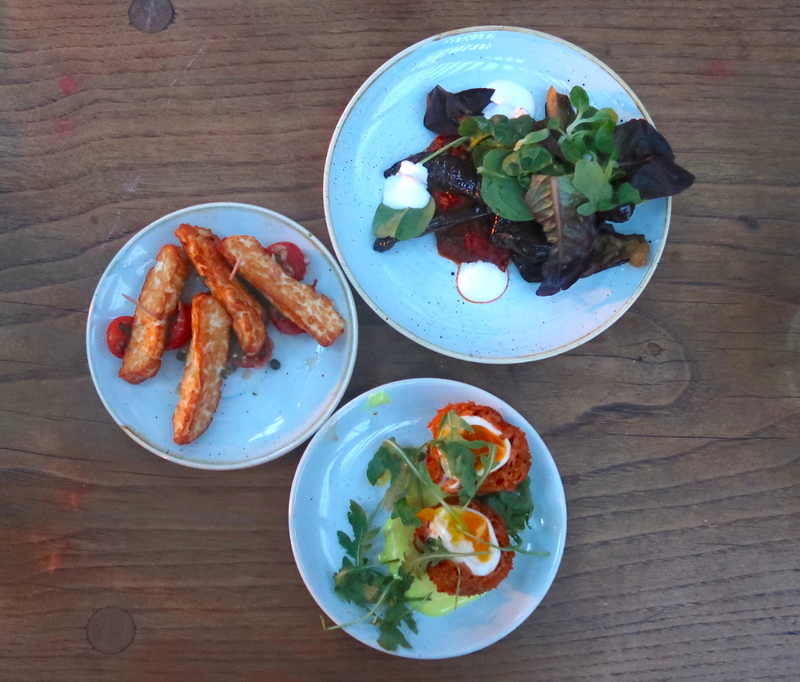 We went for the grilled halloumi (perfectly crispy and salty deliciousness), chorizo scotch egg (expertly poached runny yolk with flavoursome meat on the outside) and the spiced aubergine (just spicy enough with an almost chargrilled texture). It’s safe to say that they didn’t disappoint and I can’t wait to try the other options next time. We arrived fairly late on at 8pm so dusk was starting to set in as our mains arrived which made for a nice setting of dinner by candlelight. 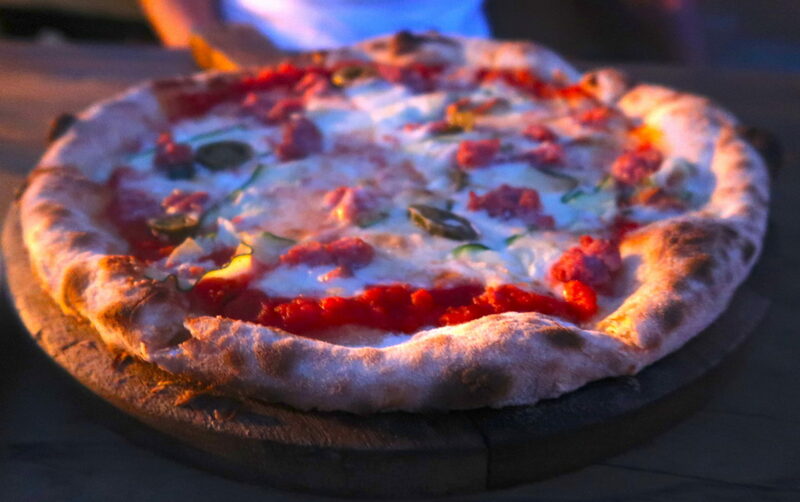 Trying one of the artisan pizzas was a necessity and we went for the Italian sausage option with scamorza, courgetta, jalapenos and peas shoots. The base was really crispy and it was just generally delicious, it would hold its own against Franco Manca in a taste test put it that way – praise indeed. The BBQ beef brisket with red cabbage slaw was melt in the mouth delicious and there was a very generous portion of meat as well. 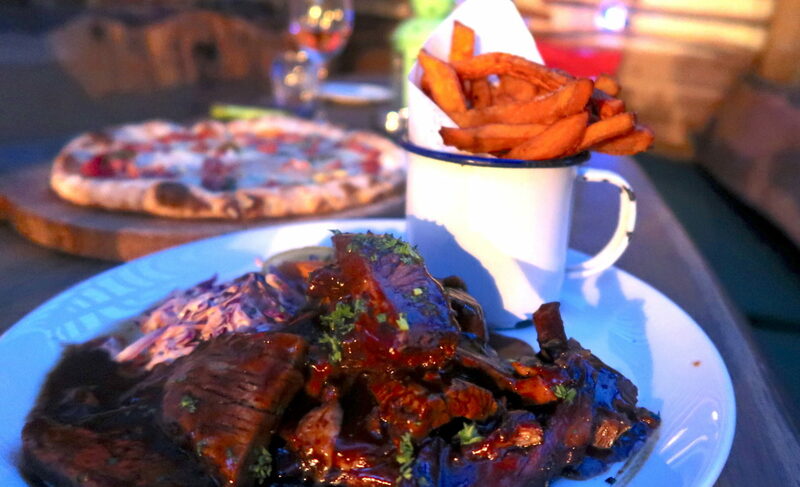 The combination of our two mains worked really well to both share and I think that the food options are so mouthwateringly enticing it’s the only way to do it as you want to try everything. 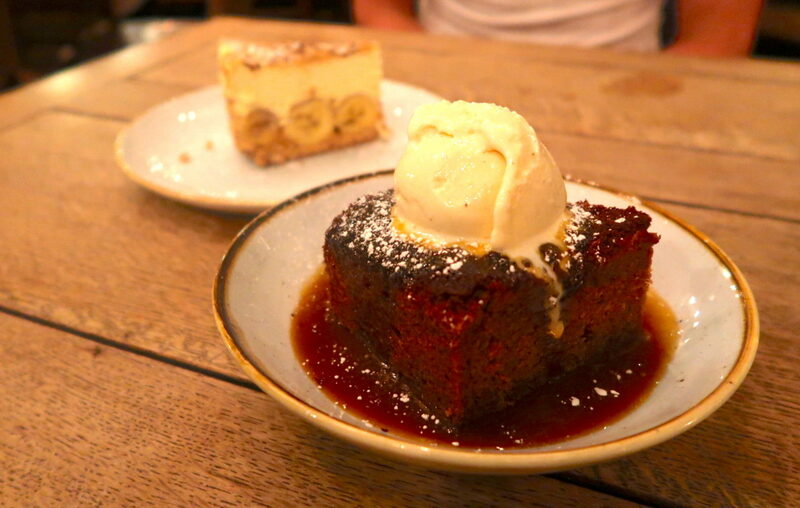 We moved inside for our pudding and you can never beat a good bannoffee and sticky toffee combo. Before they arrived at the table we were adamant that we were only going to have a bite because we were too full. Needless to say we were licking the plates by the end! All in all I’m hard pushed to find any negatives, genuinely. Even the service was excellent, efficient and friendly. 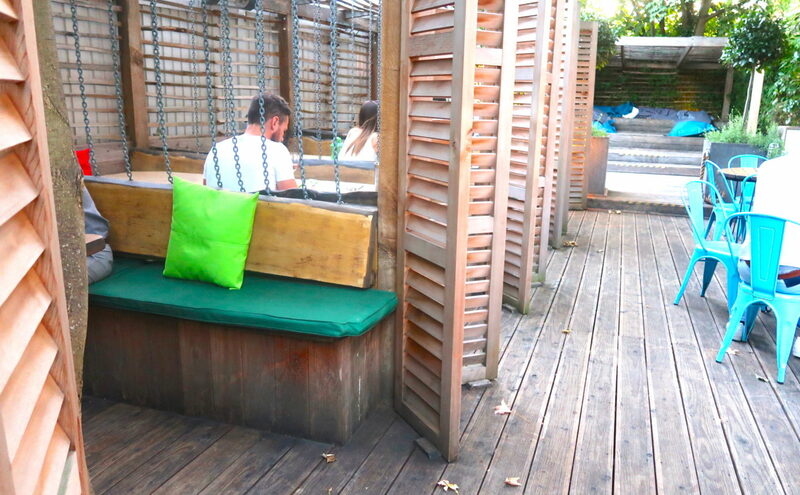 I can’t wait to return to The Avalon and have a few bottles of their delicious Pinot Grigio Blush (very reasonably priced at £20.50) sat in the garden for hours having a good old gossip on a Sunday afternoon! 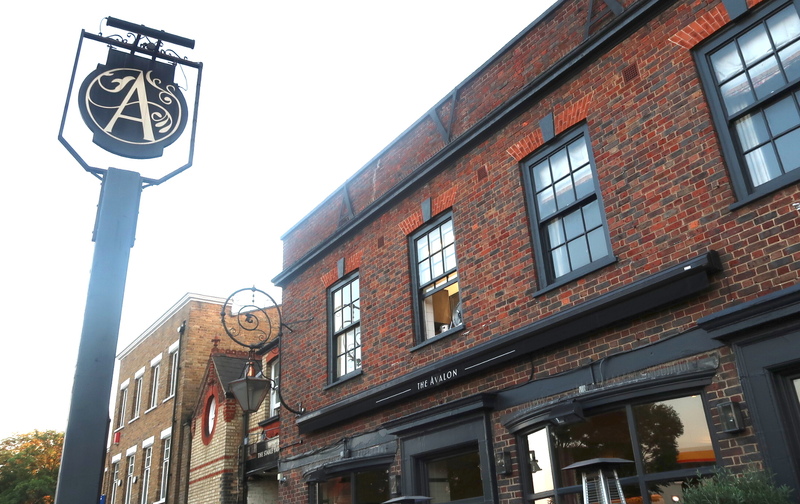 The Avalon is just a short walk from Clapham South Station – more details are available on their website.